Designed to support today’s dynamic business network, ESET Endpoint Antivirus with ESET Remote Administrator lets you focus on running your business, not your antivirus. Powered by proven NOD32® technology, ESET Endpoint Antivirus delivers proactive malware defense that balances fast scanning with accurate detection in an unobtrusive system footprint so that your business systems have the strong protection they require without needless interruptions to the end user. Light on Your System: Engineered to use minimal system resources, ESET Endpoint Antivirus ensures applications run more efficiently, files load quicker and systems boot faster. Protection from Emerging Threats: ESET ThreatSense® technology uses industry-leading heuristic malware detection to keep your business endpoints safe from known and emerging threats while keeping false positives to a minimum. Secure and Control Removable Media: ESET Endpoint Antivirus controls and scans removable media and devices for malware, closing a key vulnerability in your network. With ESET Remote Administrator, you can easily manage tens or thousands of Windows, Mac, Linux or mobile endpoints from a single console. Apply policies and rules, monitor detections, and remotely configure from any networked computer. ESET removes the complexity and repetition out of endpoint security administration. For real-time protection from the unknown, trust ESET’s industry-leading heuristic-based detection technology. ESET’s technical support team is readily available when you need help — free of charge. ESET SysInspector is a state–of-the-art diagnostic tool for Windows operating systems that provides deep diagnostic snapshots of key system attributes, from processes to registry keys. ESET SysRecue enables your business to utilize bootable system recovery media to help eliminate hard-to-remove forms of malware in the event of a recovery scenario. Fixed: IDS settings are not applied when installing .exe package installer created in ESET Remote Administrator using Remote Desktop Protocol (RDP). Fixed: Several text inconsistencies in various languages. 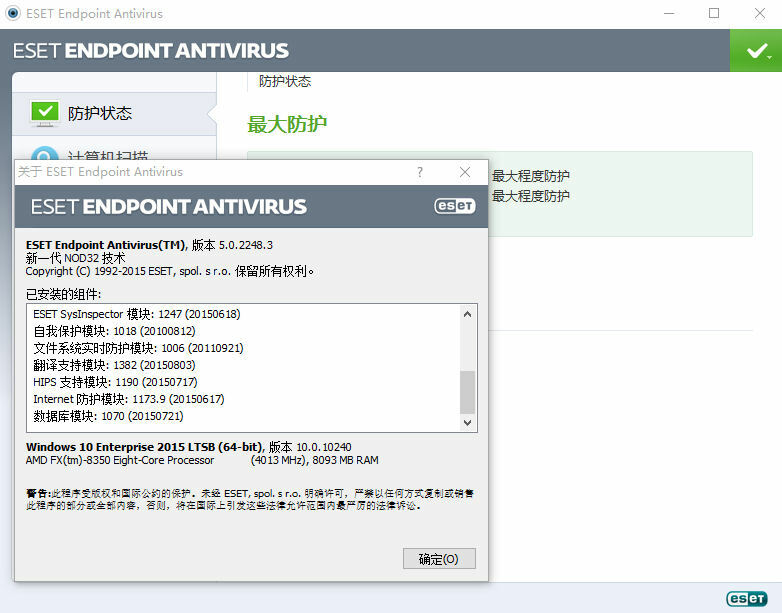 Remark: ENDPOINT 5 is the best AV of ESET for me. It works on all system even on server.